Posted on November 16, 2011, 11:30 am, by Thomas Hawk, under iPad, Photography, Trey Ratcliff. A few weeks ago I jumped the gun (as I frequently do) and published a review of +Trey Ratcliff‘s awesome new app “Stuck on Earth.” This is a brand spanking new iPad app that is probably the single best app for traveling photographers that exists on the market today. It absolutely blows away anything by the likes of Conde Nast or Lonely Planet or the Travel Channel or any of these other attempts at serious travel apps. This app was built and designed for photographers and best of all it’s absolutely free. It’s a wonderful tool for you to use in planning a trip and seeing both highly rated flickr geotagged photos as well as user curated lists of some of the best photo spots on the planet. I was one of the contributors to the app and contributed the 50 best secret shots to shoot San Francisco. Also here is Trey’s announcement on the app on Google+ from yesterday as well as a very good conversation about why he built if for the iPad initially instead of Android (even though some Android users are getting pissed about this — both Trey and I are Android users by the way). Anyways, if you are an iPad user (I bought one just to get this app) GO GET THIS APP HERE NOW!!! Posted on October 24, 2011, 12:53 pm, by Thomas Hawk, under iPad, Trey Ratcliff. Update Note: Folks, this app is NOT out yet. It’s almost out (think early Nov.) but it’s not available for you to download yet. I am one of the lucky few with private early access. This is an early review. I love the app. You will too. But you can’t get it just yet. Hang in there though! Ok, it happened. This past week I finally broke down and bought an iPad. I’ve been resisting ever since they came out. I’m not sure why, but I have. The wife and kids have wanted one like crazy. My wife was hinting that she wanted one for her birthday and so I went out last week and bought one. The biggest reason why I wanted to finally buy one though was to try out the latest app by my good friend +Trey Ratcliff, of Stuck in Customs fame, Stuck on Earth. What is Stuck on Earth you ask? Well, it’s just about the single best tool ever made for the traveling photographer. I’ve got a trip to Death Valley coming up next month (you are coming aren’t you? — details here) and so I thought I’d put it through the paces as far as helping me find awesome things to take photos of in Death Valley — and boy did it come up with some great places for me to shoot. 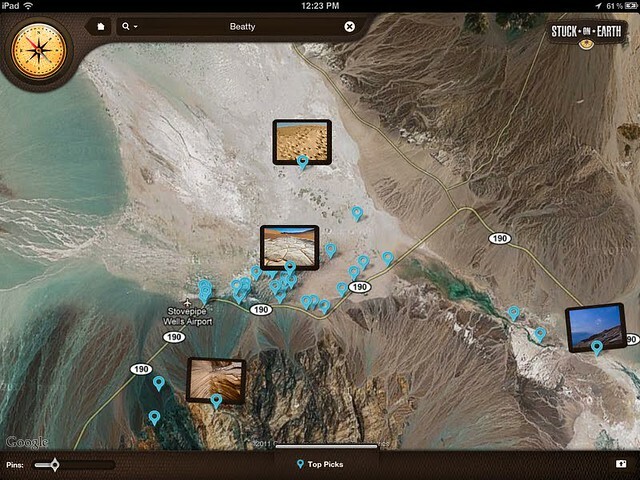 Using geotag information from Flickr’s most interesting Death Valley photos, Stuck on Earth easily pulled up some of the most breathtaking places to shoot in Death Valley. From each photo I was able to add them to my map for my upcoming trip to be accessed later. Why not just use Flickr for this directly you ask? Well, for one, at the Atomic Inn, where I’ll be staying on this trip, they probably don’t have wifi. In fact, I’m sure that much of Death Valley will not even have internet access even for my cell phone. It won’t matter with Stuck on Earth though. All of my locations will be saved and I’ll be able to access them even offline. Also when I’m on the road shooting the valley, it’s a lot easier to carry an iPad around than a laptop. Using Flickr geoinformation is just the start for Stuck on Earth though. What I’m even more excited about is the idea of curated lists on the app. 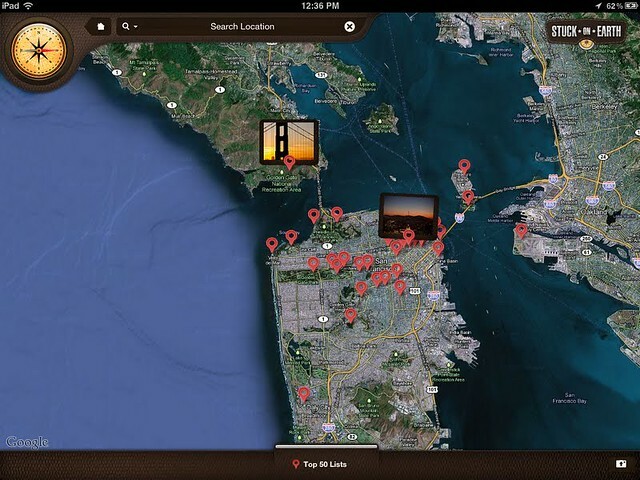 I contributed one of my own for the app which is called the top 50 secret photo spots in San Francisco. They are not all so terribly secret (well some of them are), but they are some of the very best spots to shoot the City of San Francisco from coming from a seasoned local’s (that would be me) perspective. There are also curated lists like the top 50 waterfalls in the world — or the top 50 bridges in the world. So there are both inspirational curated lists as well as geo city specific curated lists. By the way, if you have unique knowledge about a special geographical area or photographic subject matter and are willing to share your locations, get in touch with Trey’s Chief Editor Topher Martini. With curated lists, Stuck on Earth will pull together some of the most amazing photo opportunities on the planet. With Trey’s large following and especially the way he’s positioned this app as a community gift (it’s free and there are not adverts or upsells) alot of people will end up contributing special local knowledge to the app. From a photographer’s perspective, these special map points will be even more invaluable than all of the flickr geodata it’s already pulling in. There’s a lot in there now, but there will be even more in the future. I think the app will especially be a good tool for photographers looking to explore future travel plans because it will spark so many great ideas in terms of beautiful places to shoot in the world — so it will also be sort of an idea generator for the travelling photographer. 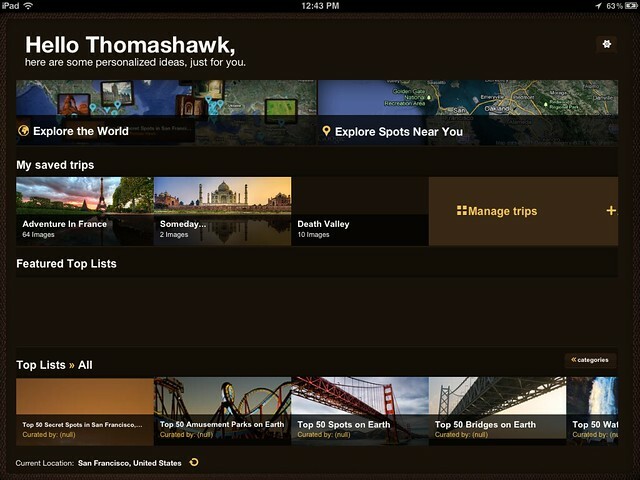 For the casual traveler the app will be very useful as well. The app (with your permission) gets your current geolocational position and can show you lots of great things to shoot right around wherever you are. In Madrid and have an hour to kill before your conference starts and want to see the cool stuff near you to shoot quickly — now there’s an app for that. Trey launched the app last Friday officially at Launch Live. People really liked it there. It actually won the audience award which is very cool. It’s not coming out for a couple of weeks still though — it should be available at the Apple Store as soon as Apple approves it (likely early November). Also if you want to learn more about the app, be sure to join the flickr group for the app here. Anyways, I love the app. I’m sure you will too. It’s super slick and I’m glad it finally got me around to joining the iPad revolution. Nice work by Trey and his team at Stuck in Customs and congratulations on what will I’m sure be a runaway hit and one of the best selling iPad apps very shortly.